Thomas Dunne Books, 9780312661847, 326pp. With the overlooked Jack Fleck still playing the course, NBC-TV proclaimed that the legendary Ben Hogan had won his record fifth U.S. Open and signed off from San Francisco. Undaunted, the forgotten Iowan rallied to overcome a nine-shot deficit over the last three rounds still a U.S. Open record and made a pressure-packed putt to tie Hogan on the final hole of regulation play. The two men then squared off in a tense, 18-hole playoff from which Fleck emerged victorious in one of the most startling upsets in sports history. On par with the classic golf narratives of Mark Frost and John Feinstein, "The Longest Shot" will surprise and delight fans as they trace the improbable journey of an unheralded former caddie who played his way into the record books by out-dueling the sport's greatest champion of his time. NEIL SAGEBIEL is the founder and editor of "Armchair Golf Blog," one of the top golf blogs on the Internet. A former copywriter for a Seattle advertising agency and major newspaper, he is a freelance writer in Floyd, Virginia. "Fifty-seven years after the fact (and in time for this year’s Open at Olympic), two books about one of golf’s most improbable upsets have surfaced simultaneously. Like the clash between Hogan and Fleck, the works pit an established, celebrated veteran against a relative upstart. And as in 1955, the upstart wins. But, unlike in 1955, it’s not close. The Longest Shot is the first book from Neil Sagebiel, the founder and editor of Armchair Golf Blog, and he makes a strong bid to create shelf space for himself alongside 21st-century golf literati like John Feinstein, Mark Frost and Don Van Natta Jr. Sagebiel takes his time, working leisurely as golf demands, but does a thorough job. And his narrative pace during the last hour of that final round, as he bounces back and forth between Hogan in the locker room and Fleck on the course, may have a rhythm more suited to a tennis rally, but here it aces." "Long before a small circle of American kids dismantled the Soviets’ Big Red Machine at Lake Placid, Jack Fleck’s defeat of the mighty Ben Hogan at the 1955 U.S. Open was as stunning and stirring an upset as sports had ever seen. In The Longest Shot, Neil Sagebiel not only expertly reconstructs the million-to-one tale of the Iowa muni pro who denied Hogan his chance to become the only man to win the Open five times, he honors the grand tradition of profound and poetic literature in golf." 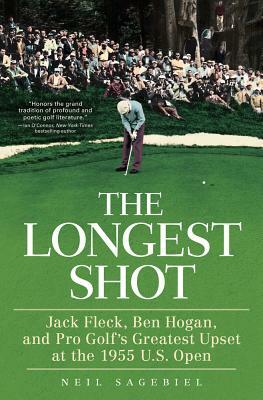 "The Longest Shot is the remarkable story of how Jack Fleck, the improbably named municipal course pro from Iowa, defeated the great Ben Hogan at the 1955 U.S. Open. Moment by moment, Neil Sagebiel lyrically describes the drama of the David-and-Goliath clash at the Olympic Club in San Francisco. Sagebiel persuades a new generation of readers that Fleck’s triumph was not only the most unlikely result at a U.S. Open, but one of the greatest upsets in American sports history. The Longest Shot is destined to become a classic of golf literature." "Iowa golfer topples big-time golf legend. Zach Johnson over Tiger Woods at the 2007 Masters? Sure, that was a huge upset. But how does it compare to another Iowa golfer taking down an icon? Jack Fleck had never won on tour, was playing a few hours behind the immortal Ben Hogan—who had already accepted congratulations for winning the 1955 U.S. Open—and had to birdie the 18th hole just to tie the four-time Open champion. Then it was on to an 18-hole playoff the next day in which the unknown Iowa muni pro knocked off his idol by three strokes. In The Longest Shot, Neil Sagebiel details how this remarkable outcome unfolded." "Lost in the pages of golf history is a remarkable story of an unknown municipal golf professional who won the 1955 U.S. Open at the Olympic Club in San Francisco. Author Neil Sagebiel’s account of the courage and determination of Jack Fleck, who late on a Saturday afternoon came out of the pack to tie the legendary Ben Hogan, and then go onto defeat him in an 18-hole playoff, is dramatically recounted in The Longest Shot. It is a Cinderella story of a young professional from Iowa who against all odds wins the U.S. Open. It is also the bittersweet account of Ben Hogan’s last hurrah." "The Longest Shot is more than the story of the greatest upset in U.S. Open history. It’s a book for anyone who’s ever risked everything to follow a dream. Golfers owe Sagebiel a thank you for lending a voice to this oft-forgotten tale." "Neil Sagebiel of Floyd County captures the drama and the ambiance of professional golf in the mid-1950s in a book that will delight golfers but also enhance any reader’s understanding of American society in post-World War II America. The story of Iowa club pro Jack Fleck’s rise from obscurity to win the U.S. Open is the essence of the American Dream....Sagebiel brings to life the drama of the tournament and the long road to arrive there. He also re-creates a time when golf was just a sport, and the players enjoyed the game without the money and the fame that accompany modern-day athletes. Reading this book is like reading the golf coverage from a major newspaper in the 1950s when a keen ability to describe the players and their venue was the key to having readers."